Hello Everyone! HAPPY NEW YEAR!! I hope you had a lovely night with your friends and family and are having a lovely, relaxing new years day! I'm expecting a lot of you reading this may be a tad hungover haha! I had such a wild night watching tangled and frozen and drinking cherry brandy with my mum and brother. I still can't believe it's 2015. The past couple of years have just flown by. As you know if you have been reading my blog since the end of November I have sort of neglected the beauty posts. Now do not worry I promise that I will be back to them soon but I thought that I would start things off with all the goals and resolutions that I hope to achieve throughout the rest of this year. Looking back on my '2014 Bucket List' post I'm extremely happy to say that I achieved all but one of those things on my list. Keep reading to find out which one. These are not too unrealistic and things that I am hoping I can achieve. If there is one thing I am good at and have been for as long as I can remember it's allowing people to put me down. This is something that I have been able to improve the past couple of years but not something that I have ever been able to truly combat. Somehow I think it is something that will stay with me my whole life but I will not give up. I will definitely try and improve on this throughout 2015. Ahh yes this is the big one that I didn't manage to achieve in 2014. I need to get my do my theory and get my license asap! I really do want to be able to pass my practical test before March if possible because I am going away to Turkey again to work this year and from my experiences last year having a car is just so much better and easier and I will feel a lot safer in my own car as well. This was my 21st birthday present from my Dad, I turn 24 later on this year so I really do think I should hurry things up and pass it haha. As much as I loved working as a rep overseas last year and I know I will have a blast again this year I am really hoping that towards the end of the year I will be able to find a permanent job. I turn 24 and I just think I need to focus on my career, earning money and saving as I do want to be able to afford to my own flat at some point. I want some independence and I just think finally having a proper job where I won't need to worry about money will just be a massive help. Ideally I would love to work in social media as I truly believe that is where my strengths lie. I may even go back into education. I'll just need to look at various opportunities. We will just have to see what happens. Living at home with my parents means that they still cook for me. They don't complain because they absolutely love spending time in the kitchen and making new things. I do spend time in the kitchen myself and can make a few simple recipes but I want to be able to pick up different things as my mum's style of cooking is very unusual and the food we eat on a daily basis is not something that can be found in restaurants or recipe books. It will also help me a lot when I go away as I won't need to worry about take aways or eating out. I am also going to try and follow a lot more food blogs throughout 2015. 2014 was the year I finally managed to lose a little bit of weight. It wasn't a lot but I worked so hard over the summer and I was permanently active due to my job. The past month I have become really lazy and have felt like I have put all the weight on especially with Christmas and New Year just gone. I am going to get a gym membership tomorrow until I leave for Turkey again. I will become slim and healthier. It hasn't been easy for me to save money at all as I just haven't had a proper job. This summer I was able to save loads but again a huge chunk of it when onto Christmas and paying off different things I had to pay off, putting money towards my theory test etc. This summer I am hoping to save a lot more money and come back with a huge chunk where I can use the 'spend a third, save a third, invest a third' motto. Wish me luck. 2015 will be the second birthday of my blog. I find it pretty incredible that I have worked at it for 2 years and still love it as much as I did when I wrote my very first posts. So many people have inspired me this year to carry on with my blog and have just proven how far you can get if you work hard enough at it. My readership grew massively in 2014. I'm very close to 500 followers and I couldn't be happier. I am going to continue to grow it and find ways to make this blog grow because I really do want it to go somewhere. Most of all I am just going to continue enjoying it. I think that is the most important thing. I am also going to try and comment a lot more on blog posts as I didn't do much of that this year and speaking to other bloggers commenting is sort of going down hill so going to try and comment on every post I read. As hard as 2014 has been sometimes I have become a more positive person. I still have a few negative thoughts and things have become difficult and I have felt like absolute poo a lot of the time but I have learned to close my eyes, breathe and just relax. Things are only as bad as you make them and my negativity has made things worse. I have bought a few inspirational books and follow loads of positive people and have learned to surround myself with people who only bring out the best in me so hopefully I will be able to become even more positive and learn to channel all that negative energy elsewhere. So there we have it, those are all the things that I hope to achieve throughout 2015. Wish me luck. God knows that I am certainly going to need it! Anyway hope you enjoy 2015. I have some very exciting blog posts coming up. Hope you enjoy them! Such inspiring resolutions, definitely don't let people put you down! 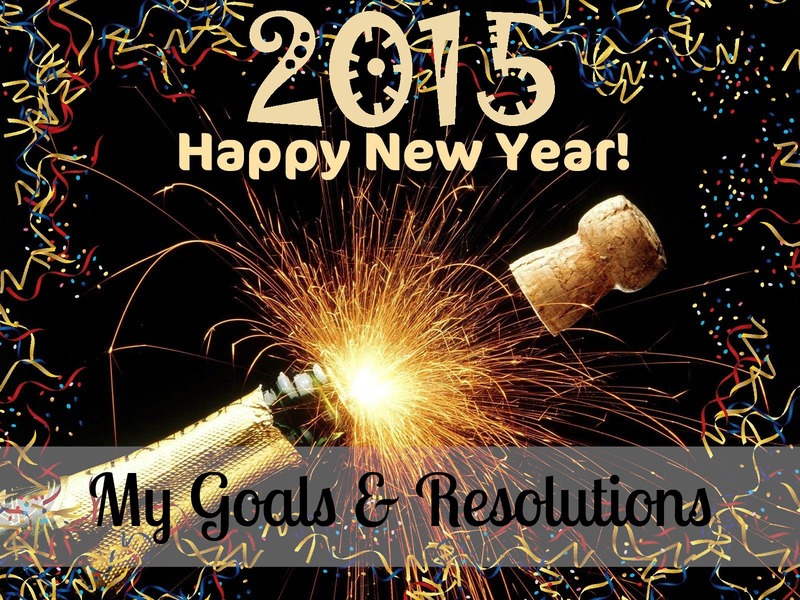 Hope you have an amazing 2015 and achieve all your goals!